CALL FOR BEST RATES, 770-656-1403. This five star platinum rated unit will be the condo you will return to year after year. We are 4th floor, ocean front, East tower. We only rent Saturday to Saturday during peak seasons. Please ask prior to attempting to book online. This is due to most guests wanting a full week. Located at the west end of Panama City Beach. We are adjacent to Pier Park, a Simon Mall Property, which is Northwest Fla. #1 shopping destination. Pier Park offers great restaurants, shopping, entertainment, as well as a 16 Movie Theatre Complex! Calypso is the closest/walking distance resort to Pier Park. This luxury resort has everything you need for the perfect family vacation. Enjoy the emerald green waters of the Gulf of Mexico from your fourth floor, ocean front condo. The spacious living room offers a pull-out queen sized sleeper sofa, that is comfortable for any guest. This kitchen has everything you need to prepare your favorite meal. With beautiful granite countertops, stove, microwave, toaster, blender, slower cooker, refrigerator/freezer with ice maker, oven, dishwasher, glassware, flatware, and plenty of pots and pans, cooking will be a breeze! While enjoying your meal, you may even see a dolphin leaping out of the crystal blue water, from this perfectly located fourth floor balcony. High enough for great views, low enough so as not to wait on an elevator for your vacation. The master suite is a romantic getaway, that will allow you to relax at your leisure. You will sleep peacefully in this King size master bed, with a luxurious duvet set and crisp white sheets. The master suite offers its own private master bath with granite counter tops. The second full bath will allow your children or extra guests the privacy they deserve. Kids will love these custome bunk beds to sleep in after their long day at the beach. Side railing is available, in the unit, if needed for younger children. 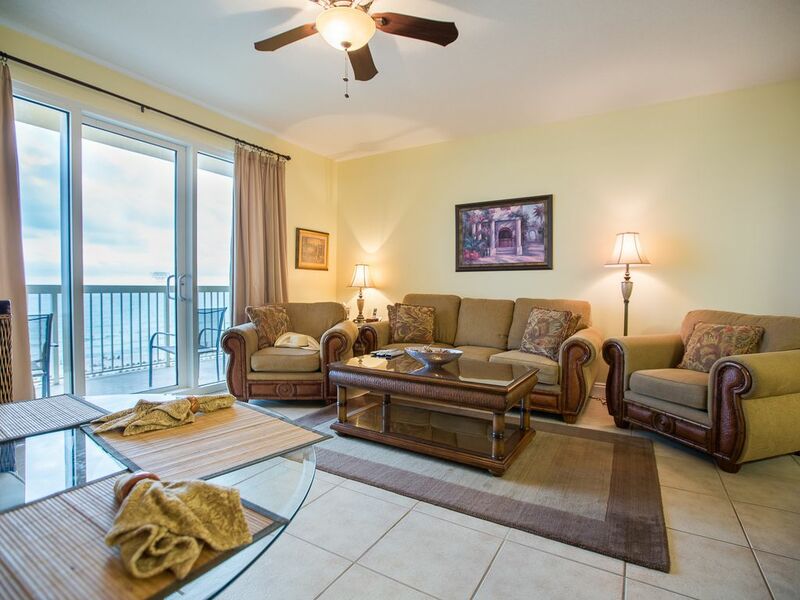 You will love the auburn sunsets on the sparkling Gulf's water, on your furnished balcony. The view from our condo is one that you will not forget! This unit is at the optimum level for pool and ocean views! It overlooks one of the two 175ft. ocean front luxury pools, separated by a full service Tiki Bar. *****FREE Daily, seasonal, beach service is included to our guests at no additional charge, which includes two beach chairs and umbrella set up daily on the beach for you. This is at least a $250 savings for a week. Don't forget your cooler and beach towels! We value our guests and will always go the extra mile to make your vacation experience a memorable one, one that you will hopefully want to repeat in 403 East. **We rent only to 25 years old or older, which means that the person renting the condo must be 25 yo or older and STAYING at the condo the entire length of your stay. Reservations made under false pretences will result in your eviction and loss of all money associated with rental. Very Nice, not too high up. We had two adults and two teens in our group and enjoyed our stay. Everything you need to enjoy a week in Panama City is here. There is a master bedroom with a TV and shower for adults and two bunk beds for teens in the main hall. The second bath includes a shower and the view from the deck is great and not dizzying high. The elevators here can be slow when it's busy so if you can handle a few flights of stairs that's a big bonus on getting to your room and a good daily workout. We had everything we needed. 4th floor was great. Anita is very easy to work with. Hope to stay again! Would stay here again ,we had a wonderful time. The beach service employees were wonderful. I broke my foot two weeks before we left for vacation and they were more than helpful. Front desk employees were also helpful. Homeaway was tops. Thank you for a great vacation. Condo was clean and being on the 4th floor was great! Very little wait for elevator. Property was clean. Beach was gorgeous. My family loved staying here. The room was very clean, extra linens and pillows, menus to local restraints, and well stocked with pots, pans, silverware...etc. we loved the view of the beach and sunsets from the balcony. Anita was awesome to deal with throughout booking, responsive to emails, and helpful with any questions i had. Call owner, Anita King, for best rates; 770-656-1403. If dates are not booked within three weeks of stay, call for last minute specials. Weeks then can be broken up(3night minimum) to not include a full week, as long as it doesn't interfere with a full week rental prior or following your requested time.